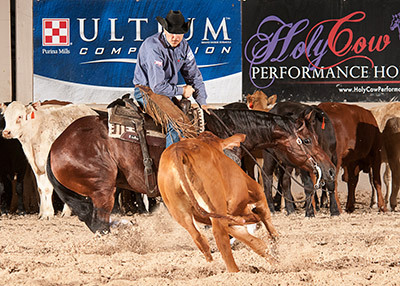 Sweet Metallic (Metallic Cat x Sweet Abra), a mare owned by Beau and Ashley Galyean, of Fort Worth, Texas, and ridden by Beau, placed fourth with a 218.5. As the top-placing Derby Open entry sired by 2005 stallion Metallic Cat, Sweet Metallic earned a $25,000 Metallic Cat Incentive bonus. Including a total of $40,000 in Metallic Cat bonuses, 4-year-olds sired by “Denver” earned more than $75,000 in the PCCHA Derby Open. That allowed Metallic Cat to surpass $1 million in offspring earnings.